More than a thousand of the ordinands’ family, friends and community members packed Sydney’s St Mary’s Cathedral last Saturday to witness Archbishop Fisher ordain the “international peacekeeping force” of Father Gustavo Criollo Farfan, Father Daney Suresh Iruday Doss, Father Mate Litric and Father Joshua Miechels who hail from Ecuador, India, Croatia and Australia respectively. 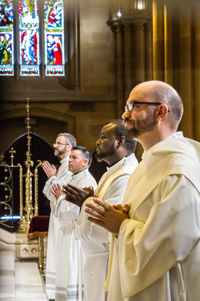 Sydney’s four new priests not only give witness to the universality of the Church, but also to the fruitfulness of the new ecclesial movements. 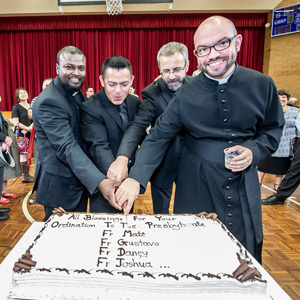 Fathers Gustavo, Daney and Mate each discerned their vocation to the Priesthood as members of the Neocatechumenal Way, and Father Joshua as a member of the Emmanuel Community. 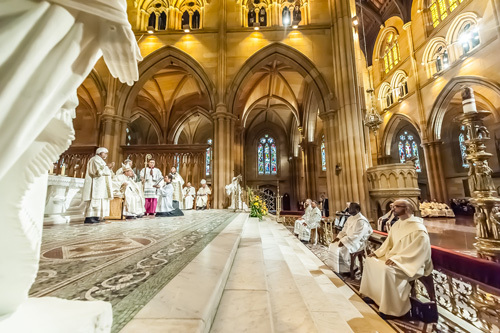 Scores of clergy from Sydney, France and other parts of the world processed in to the Cathedral to the hymn of St Patrick’s Breastplate, an appropriate forerunner to a powerful homily from the ordaining Archbishop. Archbishop Fisher began by describing images of Mass being celebrated in wartimes – in the ruins of villages, in tents, or in shelled out Cathedrals, with the Sacrifice being offered on makeshift altars of jeeps or cardboard boxes. The new Sydney priests would nonetheless be ministering in a warzone, said the Archbishop. 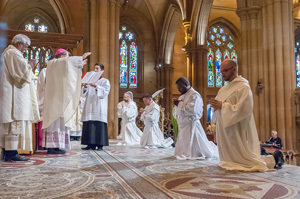 Each of Sydney’s newly ordained priests had considered the particular “battle” in which they will focus their priestly ministry. Father Gustavo is the ninth of fifteen children, and was formerly an electronics technician. In his priestly ministry, Father Gustavo will seek to proclaim God’s unconditional love in a world crying out for love. Father Daney grew up in the slums in India amongst people of other faiths. He hopes that through his priesthood, he will reach out to the lost and point them towards Jesus as the Way, the Truth and the Life. Father Mate hails from Croatia, and the oldest of the newly ordained priests. His hope for his priestly ministry is to reach out to those on the peripheries and encourage them to trust in God. Father Joshua, a “World Youth Day vocation” said that he realised that all true priests were mission men, and not just maintenance men, and hopes that he will offer the battle-weary the freedom, peace and abiding joy which comes from God. At the conclusion of the Mass, Father Joshua expressed words of gratitude on behalf of the newly ordained. He thanked the Holy Trinity and Our Lady for their role in the vocations of these new priests. He also thanked family members, the Neochatechumenal Way, the Emmanuel Community seminary formators and staff, as well as all of those who had contributed to the Ordination Mass. Father Josh also acknowledged the generosity and confidence of Cardinal George Pell and Archbishop Fisher, and expressed the pride of the newly ordained to join Fathers Thomas Stevens and Lewi Barakat (who were ordained in August) as a new generation of fishermen. He urged the congregation to pray for and help their priests. The new priests will be assigned to parishes in the Sydney Archdiocese.